My oldest son has delved quite a bit into what makes a great movie in recent years, so I really listen to his suggestions on what to watch. The reviews were so positive on Mad Max Fury Road, that he decided to give it a chance and headed out to watch it in the movie theatre. He was surprised by how much he liked it as it really is mostly a really long car chase and fight scene. While he urged us to get out and see it in a regular theatre, we just couldn't seem to find an open time, so it was put on our list for dinner and a movie night whenever it became available on iTunes. Last Sunday night it was finally time, and we sat down to watch this movie on our large screen TV backed with extra speakers. The anticipation was high as not only did our son enjoy it enough to want to want it again, but the Rotten Tomato ratings backed him up - Critics 97%, Audiences 88%. Mad Max Fury Road is a post-apocalyptic action film distributed by Warner Brothers - the fourth movie in the Mad Max franchise. The setting is desert wasteland. 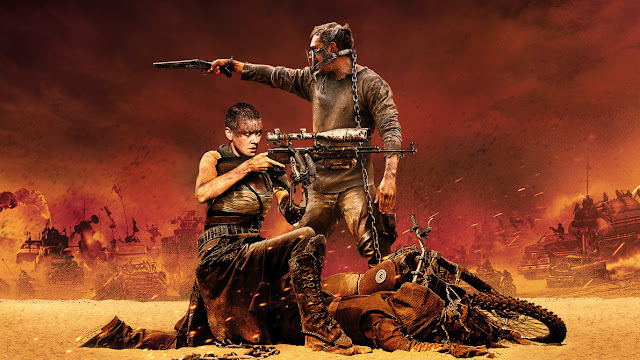 Water and gasoline are supposed to be scarce commodities, Charlize Theron (Imperator Furiosa) begins the long chase when she commandeers a large armoured tanker truck to help several women escape. 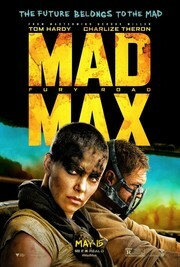 Tom Hardy (Max Rockatansky) plays a captive being used as a blood donor who escapes to join forces with her. To be totally honest - I really found the movie hard to swallow which is weird given it's ratings. Gas is supposed to be a scarce item and yet all the vehicles are gas guzzlers and everything spouts fire including a guitar played by someone on one of the chasing vehicles and spears where the ends exploded on impact. The opening scenes included a lot of brutal inhumanity and ugliness that I found hard to watch - women used as dairy cows and live human beings being used as blood donors to name just a few. The only real beauty we see is when we meet the women Theron is rescuing - the cult leader's personal breeders - who are clean, model beautiful and all draped in soft white draped fabric. HUH? All the moment needed was a heavenly chorus crooning - AAAAHHHHH! On the positive side, I felt Hardy and Theron did a fabulous job of bringing their characters to life - so kudos. I enjoyed the interesting, futuristic vehicles and weapons created. The chase scenes were full of motorcycles leaping off dunes to fly overhead and drop bombs and men swaying on poles sticking up from pursuit vehicles that could reach into the tanker. While odd - the chase vehicle with all the speakers and a guy madly playing guitar was an edgy element that worked. I don't know why but it did. I had to ask my oldest his opinion as he was a big fan of this movie after he saw it in the theatre. He was confused as he actually didn't enjoy watching it this time. It took him an hour to think it through before he could say why. In the big theatre with large screen and superb stereo system, there were was always a musical undertone and deep beat that supported each moment. He felt this music was a big part of creating tension and keeping the viewer engaged. Although we do have a good system, it wasn't enough to carry that important note at home. So a big part of the experience that made it a great movie was missing. This leaves me confused as to what to recommend. If you can see still see Mad Max Fury Road in a proper theatre setting, I would definitely go. I think it can still be fun to watch at home if you enjoy futuristic apocalyptic films, but you need to set expectations aside and understand this is a movie at its best when seen in a proper theatre setting. Had I gone in with this attitude, I think I would have relaxed and enjoyed it more.